I’m so excited to share this autumn mountain elopement styled shoot! 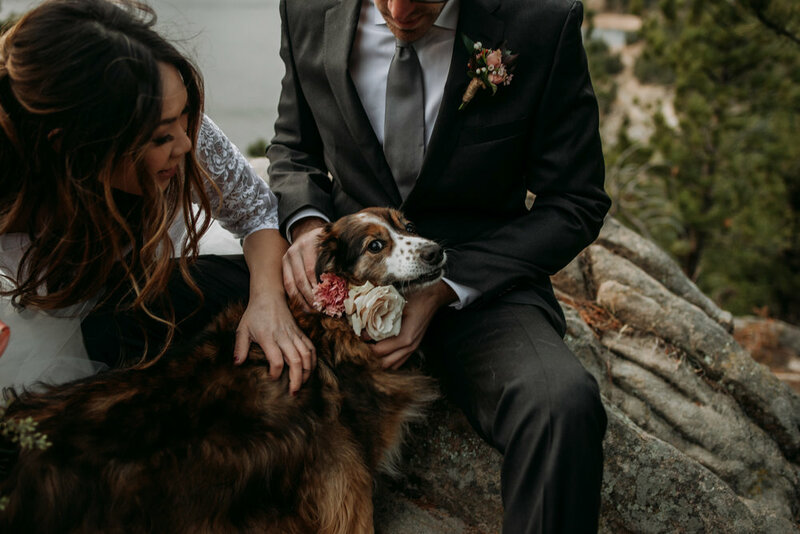 Many brides face the challenge of vying for the “best” summer dates for their wedding, but I wanted to show you just how possible a November wedding or elopement is in our beautiful state of Colorado- where every season is gorgeous! Our talented florist Rachel from a florae really brought out the autumn feel with her gorgeous bouquet and boutonnières made from light pink carnations and light pink lilies. I absolutely love the fall color touch in the oak leaves, which made a beautiful contrast with white roses symbolizing purity of intent. I think this style great choice for brides that want to show off long locks but still keep their hair out of their face during festivities (or hiking!). With Amy’s magic touch, these curls stayed strong against a fierce mountain wind. “Her fresh, clean makeup look with an emphasis on lashes was perfect for an adventurous elopement!” Amy adds. Of course, the real stars of the show are the couple’s two dogs, Tilly and Mako. If you have ever wondered if you should elope with your dogs, I’ll answer that for you! YES x A MILLION! ELOPE WITH DOGS! Tilly made the cutest dog flower girl! If you would like more information on how to book with me and get started on planning an epic wedding day, please don’t hesitate to reach out!